You know after everything I'd been told my body needed to take, to mask the pain to help me cope I found something that really helps me and when I say it helps me... it helps me in more ways than one. What if you could take something that comes from your own backyard? If you don't feel like growing it you don't have to they now supply this at your local health food store in both bulk, capsules and tea. With this simple plant based supplement I have been able to manage my endometriosis and knee pain, lose water weight, forget about cramps, reduced my headaches, regulate my sugars, flush my kidney and support my liver functions. What could this miracle be? Dandelion root ! I started taking Dandelion root sometime in April of 2010 and somewhere after a month or so I noticed my chronic knee pain was gone, then the pains I generally felt from my endometriosis were gone as well. I have since made Dandelion root a very crucial part of my day and take a tablespoon in the am and a second one in the pm religiously. 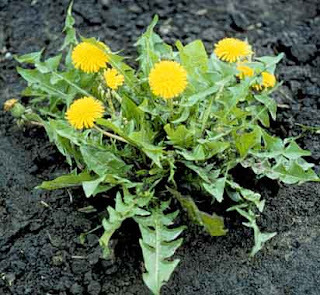 Traditionally, dandelion has been used to cure breast illnesses, bloating, disorders of the gastrointestinal system, aching joints, and skin conditions. The leaves have large amounts of numerous vitamins, including A, C, D, and B-complexes, as well as minerals like iron, magnesium, zinc potassium, manganese, copper, choline, calcium, boron, and silicon. The leaves of the plant are very nutrient-rich, and so they make good supplements for women who are pregnant or elderly women. Dandelion can also be used as a gentle diuretic and can decrease serum cholesterol in some people. The root can be an appetite stimulant and it can treat some digestive disorders. Today, many herbal doctors use dandelion to purify the liver and gallbladder of toxins. Research indicates that dandelions can treat pneumonia, bronchitis, and other respiratory disorders. Dandelion can improve general health, and is beneficial to the kidneys, pancreas, spleen, stomach, and other organs. Dandelion is also recommended for the treatment of tinnitus, tonsillitis, osteoporosis, abscesses, anemia, boils, mammary tumors, cirrhosis, water retention, hepatitis, jaundice, rheumatism, and warts. Dandelion may also be effective in eliminating or averting age spots. Some people also use toasted dandelion root as a healthier alternative to coffee. 1)It is a gentle diuretic, helping to gently remove excess fluid from your body while maintaining your potassium needs. 10)It can assist with the management of osteoporosis and arthritis. Some individuals experience stomach pain because of hyperacidity. It is safe to use with other drugs. For information on how and where to find Dandelion Root visit our "Health First Store"
What's in my First Aid Kit..